We often think of John Philip Sousa as the quintessential American bandmaster, but Sousa stood on the shoulders of a giant—Patrick Sarsfield Gilmore. 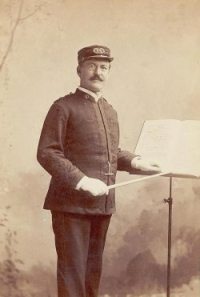 Sousa considered the immortal Gilmore “The Father of American Bands.” An Irish immigrant, Patrick Gilmore was a brilliant bandmaster who set the stage for Sousa by being the first to effectively organize a touring band, and in doing so brought the great classical works to the heartland of America. My article, In the Beginning, is a chronicle of Gilmore’s visits to the major cities of the Lehigh Valley—Allentown, South Bethlehem, and Easton.